Last Friday, my friends Dillon and Michael joined me in visiting a local high school to spread awareness about Liberty in North Korea. For security purposes, the name of the school will have to be omitted, but I can definitely say with confidence that it was a great deal of fun. The faculty coordinator was so helpful to us! I arrived a bit early, so that I could set up my computer and make sure that the audio was functioning. We showed a couple of clips. We spoke about the plight about the North Korean people, and then took the time to address why we specifically chose North Korea, as opposed to another country. We wrapped up the presentation by listing several ways that people like us – high school students – could make a difference, regardless of whether or not we had money to donate. North Korea is one of the last countries in the world without internet or other technological communication with the outside world. Personally, I felt the need to speak out on their behalf so that they could eventually be empowered to spread the word of the human rights crisis and eventually substantiate social change. This group of young students, who were part of an Amnesty club at their school, listened intently and asked great questions about how they could help. The presentation went a lot smoother than previous ones have; I guess you could say that we’re progressively improving in our presentation skills. There were no tech problems; thank goodness. I think the best part of the entire talk was at the end, when the members expressed their interest in furthering this awareness project at their school. We discussed the potential of coming back in the next semester to give a larger presentation, even potentially in front of the whole high school! This showed me that our efforts were not a one-time gig; this presentation will hopefully lead to bigger and better things. 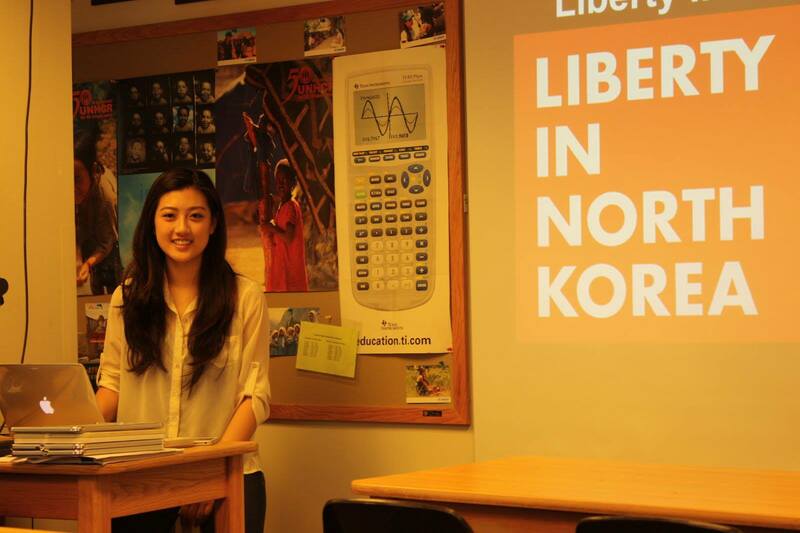 Please show your support by signing the online pledge on the official Liberty in North Korea website! Be sure to check out my other pages about the North Korean crisis, as there’s a great deal of thought-provoking information that I’ve written about. Hey Catherine! I just wanted to let you know that the link for One Man’s Escape from Camp 14 isn’t working. Thank you for that, Rosh. Fixing it now! I heard about the UN report on North Korea. It’s horrifying! It’s so hard to believe there’s a country on this earth where this is happening! I want to share this part of your blog. I’m glad to hear how well things are going with your school project! I will be passing your posts on. Good luck on your graduation and further studies in Chicago! Ohh, cold!